Nearly 16 months after the new government’s ascension to power, one can safely come to the conclusion that disasters – both natural and unnatural – pose the biggest challenge to the Sirisena – Wickremesinghe administration. It was just three weeks ago that the government grappled with a major natural disaster involving landslides and floods that rendered over 300,000 temporarily homeless. According to official statistics, nearly 90 people died due to landslides and floods, while hundreds sustained injuries. The worst aspect of the natural disaster, which struck the country in May, was its economic damage. Thousands of houses in urban and suburban areas were damaged by floods and tens of thousands of people lost almost all their belongings. On the other hand, industries, businesses and other institutions had to take a serious blow due to direct and indirect impacts of landslides and floods. According to the Finance Ministry statistics, the overall damage caused by the disaster was estimated at USD 2 billion (approximately 280 billion.) This is nearly half of Sri Lanka’s budget deficit for 2016. It was against this backdrop that a major fire and a chain of explosions broke out at an ammunition dump in the Salawa Army base rocked several areas including Kosgama, Avissawella, Hanwella and Kaluaggala,on Sunday evening. The fire completely destroyed the Army camp, one of the biggest armouries, belonging to the Sri Lanka Army. Following the explosion and fire, an utter chaos reigned as Shrapnel from the blast fell as far as ten kilometres from the area while thick clouds of smoke swirled above the camp. The armoury housed tons of ammunition, including the ones used in multi-barrel rocket launchers, heavy artillery guns and light weapons. Residents living within a 6 km radius from the Army camp were asked to leave the area as soon as possible. The majority of residents refused to leave, initially, as they were concerned about the safety of their properties. They finally agreed to leave after the government assured that the law enforcement authorities, including the Army and the Police, would ensure security for their personal properties. At the same time, thousands of people were stranded on the roads, as they did not have transport facilities to evacuate swiftly. A heavy traffic was reported along roads adjacent to the Army camp. 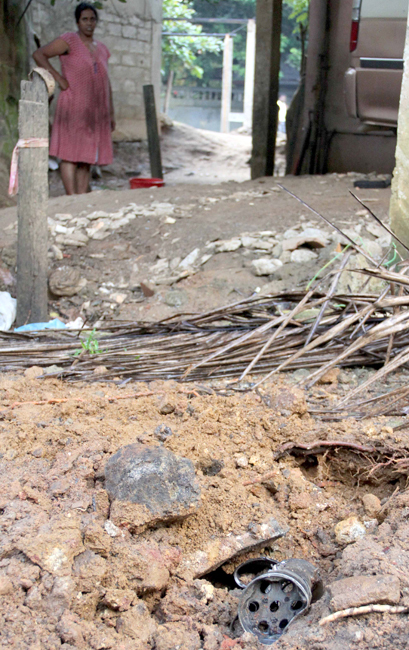 Amidst this chaos, authorities had to take measures to close the Colombo – Avissawella road as shrapnel fell on the road, on Sunday evening, posing a severe risk to civilian safety. Unfortunately, fire fighters attached to the fire brigade could not reach the area due to raging flames. Even the tri-forces seemed helpless for a few hours and they could not resort to any action to douse the fire. The Air Force deployed B2 Helicopters to monitor the situation and feed information. The situation alarmed top-level political and military circles, propelling them into immediate action. Army Commander Chrishantha de Silva, accompanied by several top-brass military officers, left for the Kosgama area, on Sunday evening, to monitor the situation. Law and Order Minister Sagala Ratnayaka, Deputy Minister Harsha de Silva and several others also visited the area to monitor the proceedings. The politicians and authorities were particularly concerned about a serious drinking water crisis looming large in the area. Large clouds of smoke engulfing the area had polluted wells and drinking water resources around the camp. What requires emphasis is the fact that defence authorities, over the past few years, turned a blind eye to repeated warnings with regard to the Salawa Army camp. In 2012, a senior officer overlooking the army camp sent a detailed report to the then Army Commander, Lt. General Daya Ratnayake, making him aware of the imminent security threat. In his report, he warned that the corroded weapons and ammunition could pose a threat to the safety of the camp and the surrounding area. He pointed out there should be a comprehensive plan to remove the corroded weapons and ammunition. The senior officer’s views were fully endorsed by the then Logistics Commander of the Army. However, such information fell on deaf ears, as the top-brass members of the defence establishment had other priorities. Instead of relocating the armoury, they further increased the volume of the ammunition dump, turning a blind eye to warnings given by senior officers. As a result of their negligence, Army also suffered a great loss. The government is yet to assess the “financial cost” of the damage caused by the fire and the chain of explosions. Apart from that, there are serious non-financial losses that would never be recovered. Certain online publications, on Monday night, reported that Around 70,000 personal files of the Sri Lanka Army Volunteer Force have been destroyed during the fire. They said there was no possibility of recovering those documents. The headquarters of the Army Volunteer Force was also located at the Salawa camp. It was crystal clear that some elements in the pro-Rajapaksa camp were attempting to gain political mileage out of the incident. Former President Mahinda Rajapaksa, speaking to reporters soon after the incident, said his government had plans to relocate the Salawa army camp. Unfortunately, it was under his government that the repeated warnings given by senior were completely ignored. While Rajapaksa was politicking on the sly, his supporters on social media platforms started fear mongering. Even before Army investigation teams reached the camp, they ‘revealed’ reasons behind the fire. They shared numerous Facebook posts stating that such a disaster would not have happened, if the Rajapaksas were in power! Despite its role in the opposition, the JVP took a sensible position over the entire issue. Addressing a press conference in Colombo a day after the incident, JVP Propaganda Secretary Vijitha Herath said setting up of an ammunition dump in a densely populated area was highly questionable and wrong. Herath said the Army Camp was established in Kosgama in 1994 by the then People’s Alliance government, despite protests from the residents in the area. “This area was not suitable for an Army camp it was a highly congested civilian area. We also submitted petitions against this decision to a minister of the then government Indika Gunawardena. Without considering the protests, the then government took measures to establish an armoury. Herath added that the Naigala Physically Handicapped War Heroes Village and Salawa Hospital are also situated in this highly populated area. It was also reported that all weapons stored at the Panagoda Army Camp were also shifted to the Kosgama armoury,” the MP said, adding that the government should take a decision over the continuation of this armoury, after considering the gravity of the damage and the risk of maintaining an armoury of this scale in a civilian area. Former Minister Indika Gunawardena’s house at Boralugoda was also affected by fire. Prime Minister Ranil Wickremesinghe, who visited the area on Monday, visited the Boralugoda Walawwa and met Indika Gunawardena’s two brothers, Dinesh and Geethanjana, who are now stalwarts in the pro-Rajapaksa camp. It is widely known in the political circles that the Prime Minister and MP Dinesh Gunawardena were classmates, over five decades ago, when they studied together at Royal College, Colombo. After this disaster, the Prime Minister left political differences aside and personally looked into issues faced by his old friend and the people in his electorate. The fire and the chain of explosions broke out at the Salawa Army camp calls for a stronger ‘accountability mechanism’ in the Army, as far as its functioning is concerned. For instance, following the islandwide power breakdown reported a few months ago, the CEB Chairman tendered his letter of resignation, accepting responsibility for the failure. Many political observers opined that the current Army Commander too should resort to such an action as the incident occurred due to an “administrative failure” in the Army. The Army did not make right decisions at the right time to prevent the possibility of a serious accident of this nature. Although it is a problem developed over the years, the final responsibility, quite obviously, lies with the serving Army Commander. Ironically, the current Lt. Gen. de Silva is from the Field Engineers Regiment Corps of the Sri Lanka Army. It is also important to understand that all Army Commanders who led the Army after the end of war should take the blame for the accident. They cannot distance themselves from the problem, turning the incumbent Army Commander into a scapegoat. The same applies to former Defence Ministry Secretary Gotabhaya Rajapaksa who controlled the country’s defence apparatus, over the past 10 years. A few days before the incident at the Salawa camp, a fire broke out at a massive military ammunition depot in Pulgaon, Maharashtra, India, killing two Army officers, and 13 civilian fire fighters. According to Indian media reports 17 people were injured and admitted to hospitals. The blaze began at 1.30 a.m. at a shed in the depot, about 115 km from Nagpur, with television footage showing flames lighting up the night sky above the largest ammunition centre in India and the second-largest in Asia. Thousands of families living in nearby towns and villages were evacuated from around the depot. On April 29, 2009, a series of explosions in the Mbagala District of Tanzania’s capital, Dar es Salaam, killed 26 people, injured hundreds more, and destroyed over 7,000 homes. 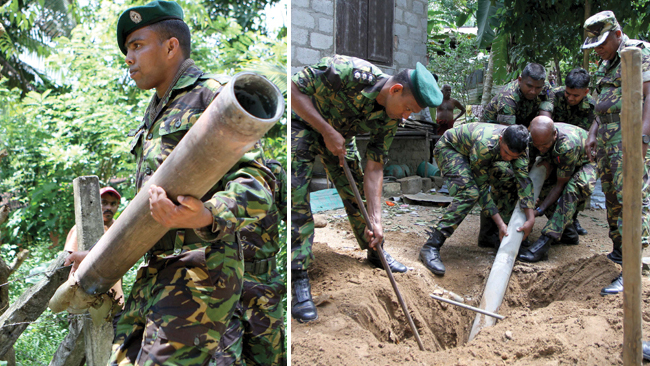 A document released by the political-military bureau of the US Department of State, in 2010, said improperly stored, or inadequately guarded conventional weapons and munitions pose as a significant humanitarian challenge as that of the better-known threat from landmines and other explosive remnants of war left uncleared from past conflicts. “Since 1990s, there have been an increasing number of catastrophic explosions at arms storage facilities around the world. The frequency of such incidents has increased as urban populations have expanded outward from city centres to the vicinity of what were often previously isolated depots. The Office of Weapons Removal and Abatement (PM/WRA) and the Defense Threat Reduction Agency remain committed to helping to confront it. The United States has partnered with more than 30 countries since 2001 to promote safe disposal of surplus and aging weapons and munitions, including 1.4 million small arms and light weapons, more than 80,000 tons of munitions, and nearly 32,000 man portable air defense systems (MANPADS). In addition, U.S. experts have worked with foreign partners to improve stockpile management practices. Where needed, PM/WRA has also deployed its Quick Reaction Force to help partner countries mitigate risks from potentially dangerous depots, as well as operations to safely remove and dispose of materials following incidents at these facilities. The frequency of such incidents has increased as urban populations have expanded outward from city centres to the vicinity of what were often previously isolated depots. Since 1995 there have been 218 known incidents involving these dangerous depots, resulting in more than 4,700 fatalities and nearly 5,700 injuries, according to experts, “ the US State Department report said. A document released by a body attached to the UN revealed that according to the Small Arms Survey, over 700 fatalities and more than 3,000 injuries have occurred from such explosions during the past two years alone. “Much of the world’s ammunition stockpile dates from the cold war period. Today, 20 years after the end of the cold war, much of the ammunition produced in that period is approaching the end of its life and becoming unstable. Without positive intervention there will be more explosions. These events will result in large numbers of casualties, widespread destruction of infrastructure and the disruption of the livelihood of entire communities. International support is addressing the havoc once caused by landmines around the world, but acquisition of funding for Ammunition Safety Management projects is sometimes more difficult than that for demining,” the report said. The problem surrounding the Salawa Army camp suggests that the relevant authorities had not taken measures to ensure internationally accepted safety standards. This is, needless to say, a problem faced by nations across the world. This incident pushes the government to adopt strong measures on the weapon and ammunition management front to prevent such incidents in the future. It was in this context that Prime Minister Wickremesinghe announced in Parliament yesterday that a committee comprising the Tri Forces has been appointed to conduct a proper inquiry on the explosion at the Salawa Army Camp. Responding to a question by UPFA MP Dinesh Gunawardena under Standing Order 23/2, the Prime Minister said a DIG has also been appointed to support the inquiry. “The Security Council has taken a decision to make a special statement on this after completing the inquiry,” he said. “The cause of the fire at the Kosgama Salawa Army Camp on Sunday that triggered a series of explosions in the ammunition dump had not been ascertained so far,” the Prime Minister said adding that investigations have also been launched by the Army and the Criminal Investigation Division. “Measures will also be taken to establish concrete bunkers in deserted areas of the country to protect the public from such sudden incidents,” Prime Minister Wickremesinghe revealed.